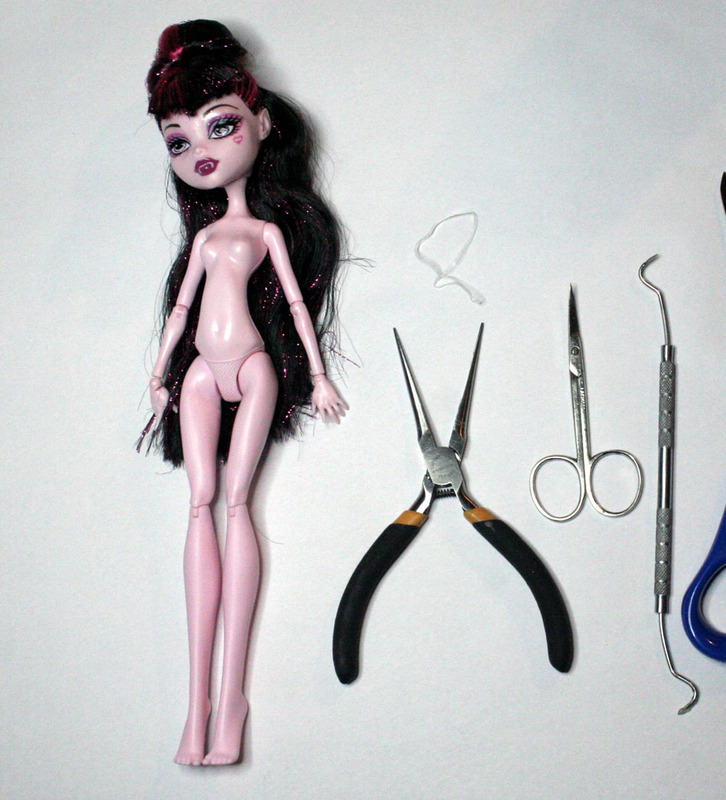 This will be the first of a series of tutorials on customizing Monster High Dolls. PB has taken lots of photos, and we will be posting them here along with instructions and information you might find helpful and or interesting. PB has a lifetime of experience in the arts, and puts all of those experiences into her custom dolls. 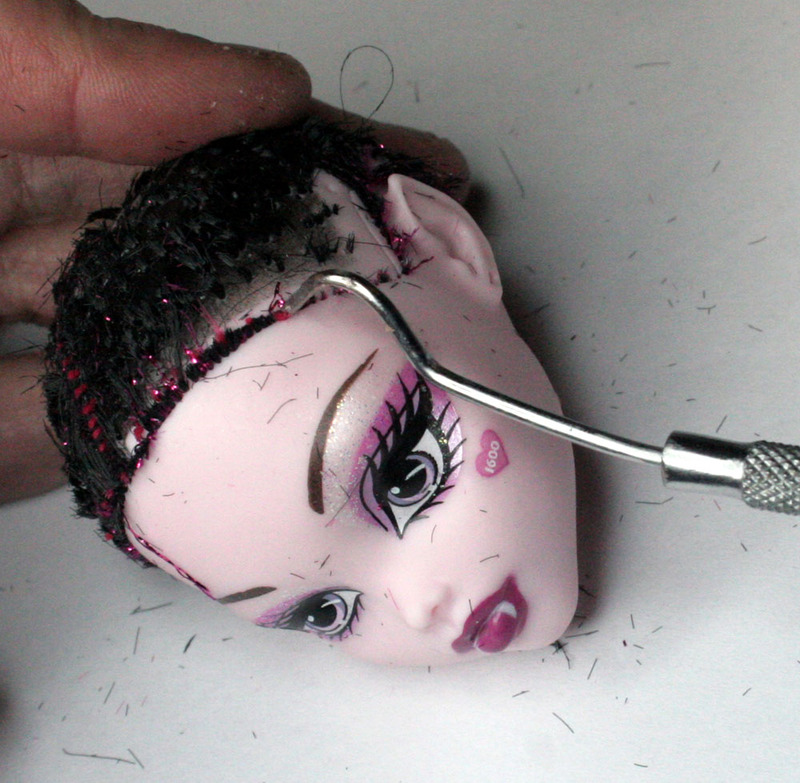 Part one is on removing the hair and part two, base painting of dolls. Now, remember, if you comment on this post, you get a second entry in the June Drawing. There will be more posts following this one documenting the process all the way to completion of the doll you see below. You will need, in addition to what you see above, a blow dryer. I use a blow dryer to heat the plastic around the neck to make removing the head easier. It decreases the chances that you will break the inner neck piece if you heat the plastic. TOOLS: Manicure scissors, dental pick or large needle, needle nose pliers, grip nose pliers. Rubber Band the hair before you cut it. 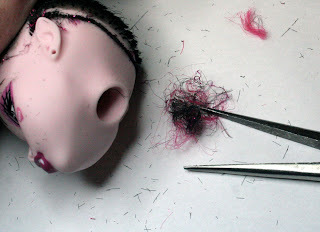 Use a dental pick or a large needle to push the hair down the holes the hair is poking through. Use Needle Nose pliers and grip nose pliers to remove the hair from the neck hole. There was glue inside this head- and that made it difficult to remove the hair with the needle nose pliers- I needed the grip nose style pliers to remove the hair. Cut off hair is plastic bag, head is clean and free of hair. I use a nail file that has a buffing side and a regular side to sand down the ridges on the legs, and any other areas that are rough or raised. 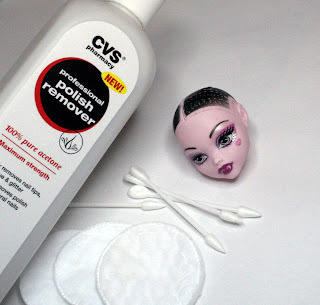 I use acetone and swabs and pads to remove the paint on the face. Change your swabs often or you will just smear paint everywhere. I use the pointy end to get into small spaces. Because I am going to spray paint this body, I have wiped it down with acetone- quickly and lightly. Acetone will MELT this plastic. Use caution! If you are afraid of melting the body, wash it with soap and water, and let it dry overnight. You have to remove the mold release that is on the plastic- or the paint will not stick properly. Now, here is my big secret- I use automotive Interior spray paint for fabric and vinyl. It will stick and cure on both the head and the body. 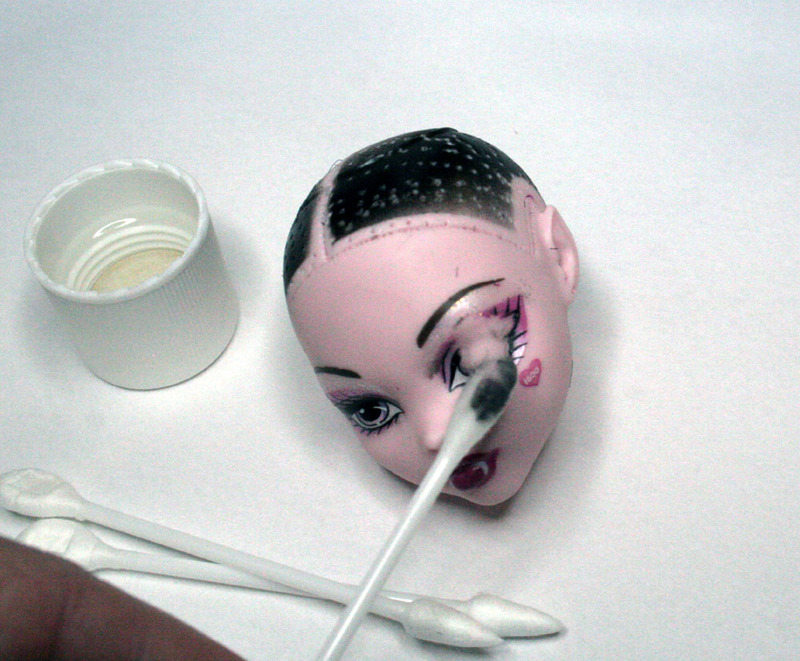 I am painting this doll and her head white. The one drawback to this paint- it comes in limited colors. I use cardboard boxes to paint in- keeps the overspray to a minimum, and I can take everything inside after I have painted it without touching it. Vinyl paint dries fairly quickly. Make sure you shake that can well. I don't want her to be this pink- so a second coat is due- both for the head and body. Jen asked about how well the paint sticks... it sticks well, providing you have removed any dirt, oil from your hands and the mold release agent. If you have not done so, this happens. It flaked as soon as I touched it. I missed taking off some of the mold release. I will re-paint this - but the first step is to see how far I missed with the removal of the release agent. I rubbed it with my fingers. Larger area now. Next step- I wiped it with acetone. The area is now ready for re-painting. 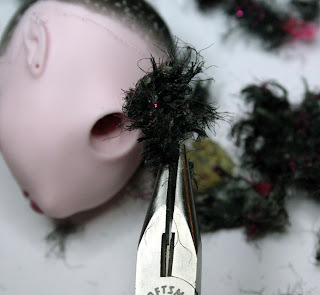 Making a Feather Wig for your dolls! Hey, I've actually got a question on this. 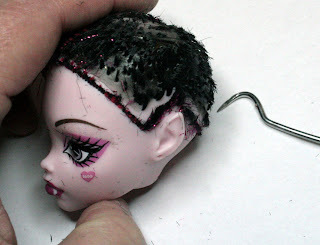 Do you have a problem with the spray paint scraping off at the doll's joints or does that type of spray just really bond well? This is a great tutorial, in depth information and clear simple pictures :) lovely! Ashley~ You must use 100% acetone. Things like oily nail polish remover and such will just make a mess. 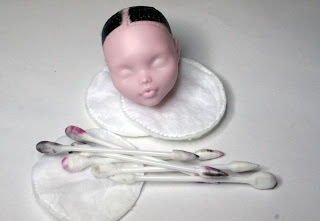 Also, it is important to use cotton wipes and swabs- they will absorb the paint. Polyester "cotton" balls do not work. Some paper towels can scratch the vinyl. Great tutorial PB (this is bauhausfrau from MH dolls) Your tip about the mold release is brilliant - now I know what I was doing wrong! I've got a question about the acetone, I usually use paint brush cleaner to remove the face ups, any idea if that will that work for cleaning the body of mold release? I do not use paint brush cleaner- and I assume you mean something like turpenioid? It has an oily base - and I don't use anything with an oily base, unless I plan on using an oil based paint on top of that. Plastics are very tricky- and what looks fine today can be a horror show 3 months down the road after one chemical reacts with another. Best thing for removing mold release is soap and water and something like a cotton terry wash cloth. I also use acetone and sometimes hydrogen peroxide or alcohol- depends on what I am working on. this is AWESOME!! 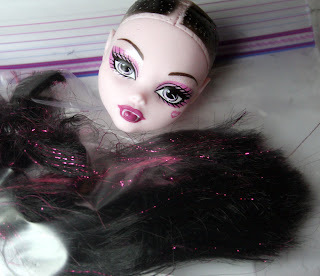 cuz i really wanted a white doll, but with draculaura's face. but i noticed this spray paint only comes in gloss for white, i like it having a more matte finish. will the doll be all shiny, and glossy with this spray paint? this is AWESOME!! cuz i really wanted an all white doll, but with draculaura's face. but i see the white for this specific spray paint only comes in glossy. i dont like my doll being shiny, glossy, or having a wet/oily look.... will it be like that if i use this spray paint? Unfortunately, Rustoleum doesn't carry a matte white in their vinyl paint, but VHT Vinyl Dye has a "satin white", which means you'll get a little gloss but it shouldn't turn out super shiny. Grisson/Magix leather dye is readily available in the UK, but oh does it look nice. Check out their projects page to see how cleanly it finishes on plastics. 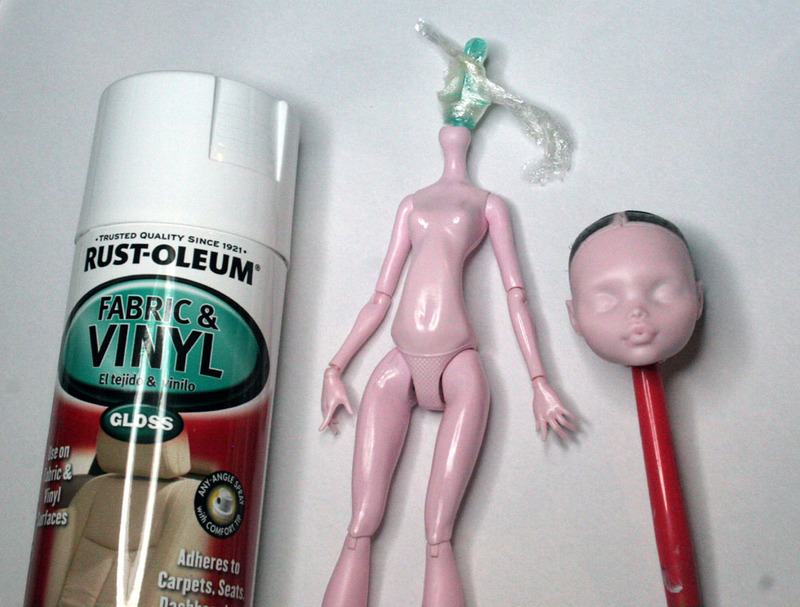 I always use a flat spray on sealer on my dolls. You can use Mr.Super Clear Flat or Testors Dullcoat flat. Be aware you may lose some detail when you do this- as is mentioned in one of my other posts. just curious about paints. is that the only paint that works for making custom dolls or can you use different paints? Depends on what kind of doll you are painting. I use Liquitex acrylic paints with the sponge method most of the time- but I also have different metalic paints and other spray paints I use. thanks! 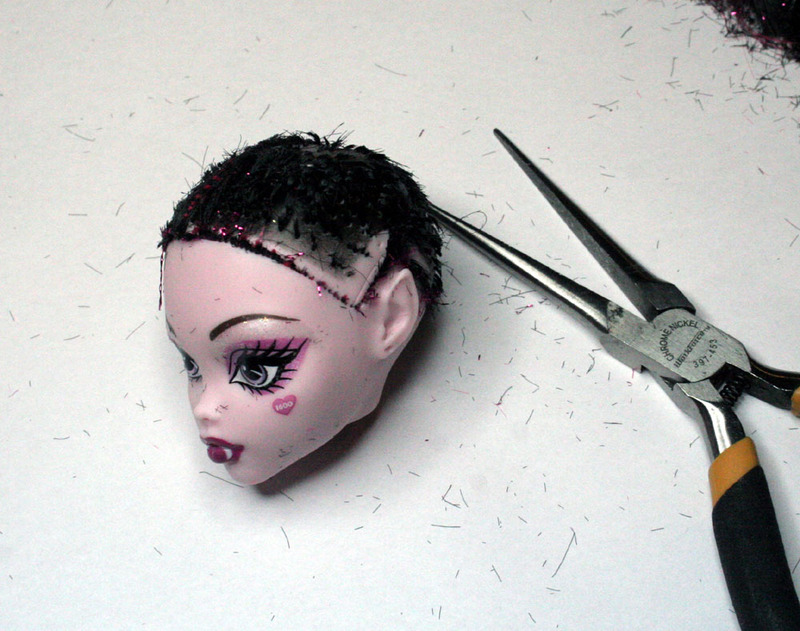 I am looking afford to creating my own custom monster high dolls! how much does this cost altogether? I saw you doll looks fairly pink with one layer of white paint, is that like that in reality or is it just the photo? I'm looking to custom an MH doll and I need to change her body to look more paleish and now it's a very pink cat cam. Thanks for this tut btw!! 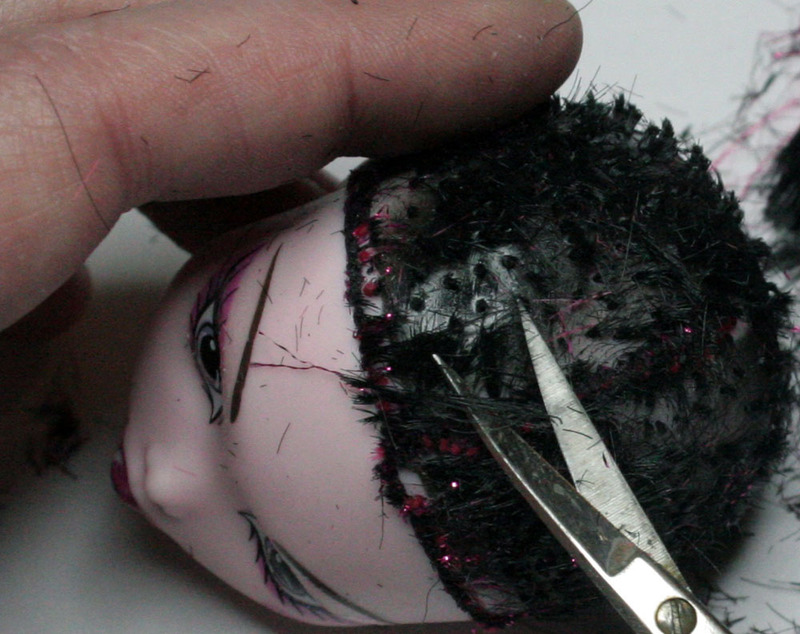 When I paint a doll I use light layers of paint. They dry faster, and look better. Yes, with the first coat the doll still looks pink. Look at the very last photo in the tutorial, and you can see where the paint is scratched away- you can compare the first layer of white to the original pink color. When you paint, do not get the spray too close to the doll. Do a little bit at a time- and wait for it to dry so that you can see what color is there. Sometimes I want to change the color- say to a different shade of blue- I will paint her white and then use the sponge technique to paint her the shade of blue I want her to be. You are only limited by your imagination. This is fantastic, thank you so much, I've been wanting to remake a few of our dolls and didn't know how to start. Off to search your wonderful blog for more information and tutorials! Thank you for sharing your tips and tricks with us newbies!! Thank you, I look forward to trying these techniques. This is a really basic question and shows how much a tomboy I was raised - regarding the nail file - what is a buffing side vs a regular side? Other tutorials I've seen suggested the buffing blocks - I bought two from Sally Beauty Supply (a pink and a yellow that had numbers on them)and I don't know the difference other than one is rougher than the other. Any thoughts? Unrelated question - I also collect these dolls and some like Lagoona come out with "box hair" - the curls are all tangled and gummy and I know if I brush it it will look worse. 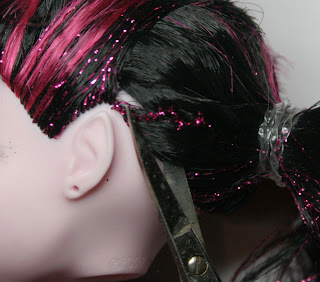 How do you maintain doll curls in general so they keep their tightness? Thanks again! I've seen many tutorials but the authors don't always answer questions! Nail File: I use the rougher side- gently- to take most of the ridges off. Then I use the buffing side to smoth the areas I used the rough side on. It makes the leg oe arm smooth again. Buffing pads are fine- typically I use files for lots of things- and pads cost more as a rule. So, sand then buff. Ugh. Box hair. 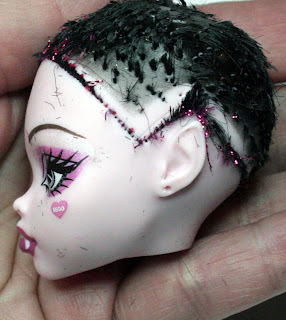 I should do a tutorial (when I get my life back) on setting doll hair. But here are some pointers. 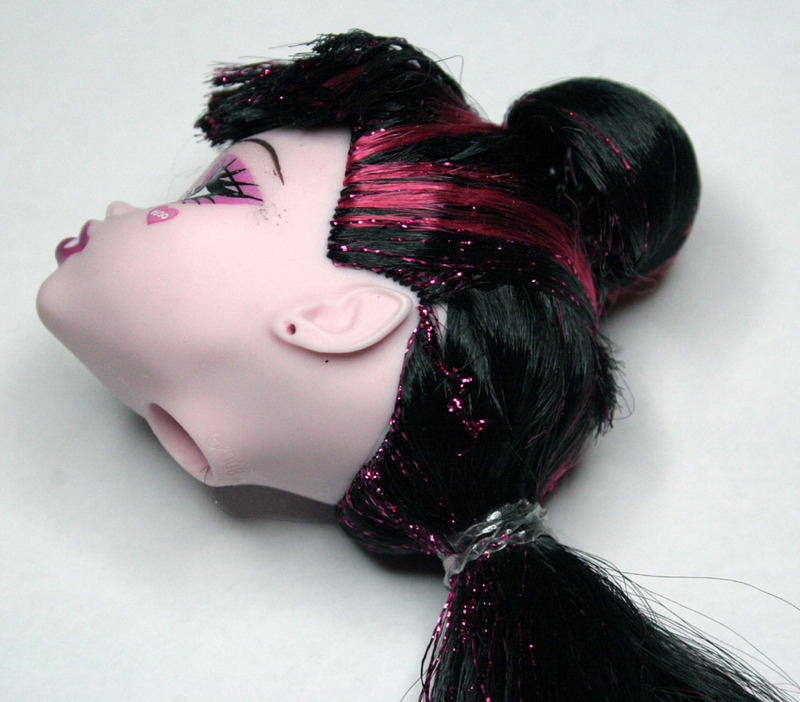 I washed my Lagoona's hair with shampoo twice, rinsed it clean. I use a fine tooth comb to comb and section the hair. 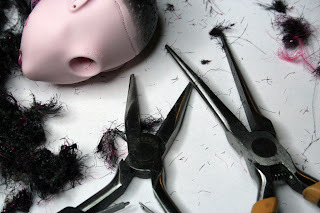 Scissors to cut the soda straws and the odd bits of hair you will find when you comb it out. A small bowl you can put boiling water into - I use a glass bowl or a large mug. Use the gel on the ends of the sections of hair before you put the end setting papers on them. Ask at the beauty supply how the papers work- I fold mine in half over the hair ends. This keeps the ends smooth and helps with rolling it onto the straw pieces. After you have a section rolled up, pin it. Once the hair is all set, it is time to boil the water. Put the boiling water into the bowl and dip the head in for a count of about 15 seconds. WAIT for it to air dry- I had one doll it took 2 full days. So, patience. When you comb it out, you may want to use the actual doll brush that came with your doll. Take your time and be gentle- it should do the trick. Straws: the bigger they are, the bigger the curl, the smaller they are, the tighter the curl. If you simply want to straighten the hair, you can use the boiling water method, followed with a comb out with some hair gel- and that usually works just fine. You can also use hair conditioner- it sometimes works well. Plastics and vinyls are not all the same. Doll hair will have differences. You may have to dunk the hair longer in the water or use more gel- depending on what it is made from. Hello~ Thanks for sharing the tutorial! I'm going through the process of changing base color now and doing a re sculpt on the head. The spray paint I used seemed to work pretty well up until the joints (Specifically the knees) keep scraping off when they're moved. Do you have any problems with that at all? Thanks for putting this tutorial up! I'm going through the process of changing the base color of one of my dolls, the spray paint I have is working well on the plastic but I'm running into a problem with the paint scratching off of the joints (Specifically the knee joints) Do you run into this problem and/or know how to deal with it? It's driving me crazy! The paint will scrape off in the joints- there is nothing you can do about that really. You can keep it at a minimum by allowing the paint to completely dry and set for 7 days, followed by spraying with clear flat in 2 light coats - and again, let the doll sit for several days.. The longer the paint is in place, the better it adheres to the surface. It actually shrinks and clings tighter to the doll. I don't know what color you are using, and I don't know what the design for your doll is, but if she is going to be dressed, you will not notice this as much. Did you look at Candy in the later tutorials? You can see the pink- if you look - in the joints. You say acetone will melt the doll skin. Yet you used it to remove her body paint. Did you use a special technique? Also, you said soap and water wash could be used to clean off the mold release. Dawn soap? If you are very careful with acetone you can use it to remove paint on the Monster High doll bodies- but- you must be very quick and light -- or your cotton will stick to the body and it will leave marks. Dawn soap is fine for washing the doll- make sure you have all of the soap off as well, or that too could frustrate your efforts. Hi, i have a doll in a really bad way...i would like to make her into a human/cat hybrid! I am sure i saw somewhere that i can bake sculpy onto a doll and bake in my kiln at 130 degrees c. I think i would need to insulate the doll plastic with foil. Can any one tell me if the have done this successfully? I do not recommend ever putting a doll into an oven at any temperature. I have no experience with sculpy and dolls in ovens. The one problem with heating up plastic and vinyl can be the gases that come from those products when they are heated, and the other is deformation due to heat- which you may not be able to fix if it happens. You can also use air dry clays- but they do not hold detail like Sculpy or Magic Sculpt. Hello! I followed your tutorial, but I'm stuck .--------. Well that does put a dent in things for you. Some people use paint thinner - like you would clean your paint brushes with. I have not used it, so I don't know how well it works. I will ask around and see what else might work for you. How do you put the head back on once you've finished with your changes? You push it back on carefully a bit at a time. It is easier to put back on than to get off. Thank you for the great tutorial. I have a question for you. 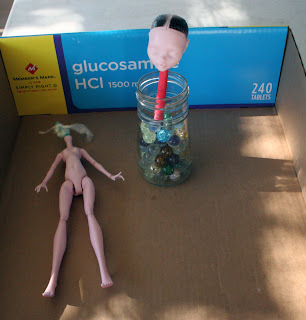 Do you recommend soaking the doll head in acetone to remove the glue from the rooted hair before taking the tweezers to it? I look foward to the rest of your tutorials, thanks again. No. Do not ever soak vinyl in remover. Thanks so much. Happy you are here too! I find thisbsite very interesting. I was once a crafty person. But in the midst of a depression because of a failed business. This could help me and bee my therapy. So great to finally find information on prepping the bodies! 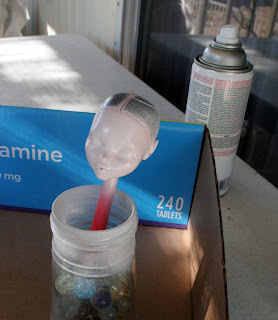 I'm new to this art form, but know from painting and customizing plastic doll furniture and accessories that plastic and resin needs to be prepped and roughed up a bit to hold paint. But I was concerned that with dolls, those kinds of treatments would be too rough on the finer look we want for a doll! Long way around to just say thank you for sharing! Is it actually safe to put sculpty polymer clay directly on the doll and bake it like that or should you sculpt the parts by hand bake then then glue then them on ?? ?